Many people take great time and effort to make their gardens look attractive, colourful and enticing places to relax during the day. But with all that effort put in, there’s never been a stronger impetus to enjoy the splendours of the garden in the evening, as well. With creative use of outdoor lighting, our gardens can be transformed into ambient areas with distinct appeal. Here’s how to make the most of your garden when the night sets in. Adding outdoor lighting to your garden can give it an instant, glamorous look for the evening, which means you can enjoy the benefits of it way beyond the daylight hours. 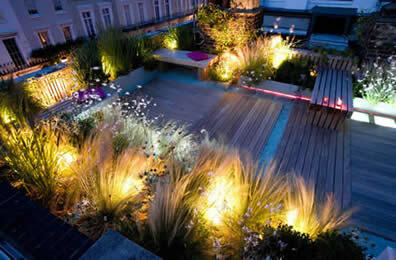 Garden lighting allows you to make the most of your garden space as a living space on warm, sunny evenings. It also creates a relaxing, tranquil ambience – the perfect tonic before winding down for bed. Garden lighting is so vast and varied, that you can incorporate it to give your garden unique style, depending on the effect that you’d like to achieve. For example, if you have a pathway or patio area, you might want to use lighting along the edges to make it stand out. You might want to incorporate spotlights to emphasise a feature area such as a rockery, pond or specific bushes or plants. Many people choose lighting to focus on one particular area, rather than illuminate the whole garden. Focusing on individual areas breaks the garden into sections, giving it more appeal and interest, creating unique shadows and designs. Lighting can also be used as a temporary means if you have a party or celebration outdoors. There are lots of different types of lights you could use for this which aren’t expensive or difficult to install. Aside from making your garden look attractive at night, outside lighting serves some useful functions, as well. It can allow you to see where you are going if you go out in the garden in the dark; many people choose outdoor lighting in their gardens at the front of their house for when they come home late. But it can also act as a deterrent to burglars or intruders who will be put off entering your property if they can see it is lit up outside. Many estate agents also argue that outdoor garden lighting can add value to your home, should you decide to sell. The type of lighting you might want to choose to have in your garden will depend on the purpose you want it for, and what sort of effect you want to create. If you want to highlight a particular plant, tree or garden ornament, even, you could consider installing up lighting, which are lights buried into the ground, which shine upwards. In contrast, down lighting is placed high up and shines down on areas below. You might want to combine spotlights at different angles, to highlight a particular feature in the garden. Placing lights below or behind a feature can be an awesome idea if you want to create shadows and shapes. At the very simplest, you might want to add outdoor candles to your garden. Although they are only a temporary feature, they are inexpensive and give you the flexibility to place them in different arrangements according to the atmosphere you want to create. Citronella candles not only smell fragrant, but are great for warding off nuisance insects pesky especially mosquitoes in summer. Garden flares and torches can also add dramatic lighting effects for a special occasion, as can dainty fairy lights on a string.